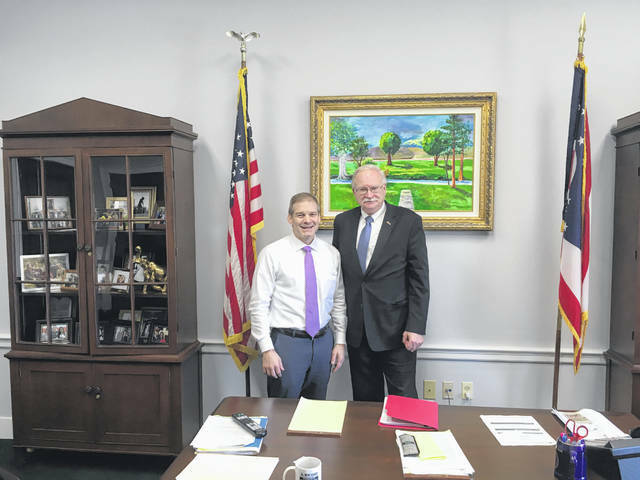 U.S. Rep. Jim Jordan, left, is pictured with Mayor Mike Barhorst following their meeting at Jordan’s Washington, D.C. office last week. Barhorst was in Washington, D.C. to attend the National League of Cities Congressional City Conference held March 10-13. SIDNEY — Sidney Mayor Mike Barhorst recently attended the National League of Cities Congressional City Conference in Washington, D.C. The conference provided the opportunity to attend sessions centering on three themes: advocacy and communication; economic development; and, infrastructure. Barhorst and more than 2500 delegates were registered for the four-day conference, March 10-13. The conference also provided the opportunity to meet with members of Congress. Barhorst also spent time on Capitol Hill, visiting the offices of several congressmen and senators. Among others with whom he met were Fourth District Rep. Jim Jordan, Sidney native and Eighth District Rep. Warren Davidson, 12th District Rep. Troy Balderson, and 15th District Rep. Steve Stivers. As OML Executive Director Kent Scarrett and Barhorst visited each office, they pressed the need for infrastructure funding. Trump’s budget includes $1 trillion earmarked for infrastructure. While in the office of Sen. Rob Portman, the topic that dominated the discussion was recycling. Staffers had contacted Barhorst prior to the meeting to ask for information on difficulties municipalities in Ohio were experiencing with their recycling contracts. Barhorst developed a series of questions for the survey instrument that was then forwarded to all OML members. As the municipalities responded, he then forwarded the information to Portman’s office. “The problem is due in part to the tremendous success of our nationwide recycling efforts,” Barhorst said. “For those who have followed the trend toward increased recycling in the United States, you probably know that for years, about one-third of our recyclable materials have been exported to China. China wanted the recyclables as raw material for their burgeoning industrial base. “That all began to change in 2013, when China made the first of a series of policy changes designed to reduce the amount and types of recyclable materials allowed into their country,” Barhorst continued. Barhorst attended the conference in his capacity as president of the OML. His expenses were paid by the OML.